It occurred to me this morning that sometimes (no, really ALL the time) I live as if someone is judging me. Before I do anything, the little voice inside my head begins to question, raise doubts and it’s absolutely favorite tool – remind me of past history that didn’t end up pretty. And guess what — nothing changes. Nothing moves. I remain stagnant and do not expand, learn and grow more…of me. The answer lies deep in the heart. The place where I KNOW that I was meant for something more…than this. The whisper of hope that I sometimes catch when my mind (and critical voice) are quiet. The pool of stillness where words do not intrude. When I drink from that pool, I am refreshed. I am renewed and I KNOW that my life has meaning and purpose. I walk taller, speak with compassion instead of criticism and think thoughts that expand instead of contract. 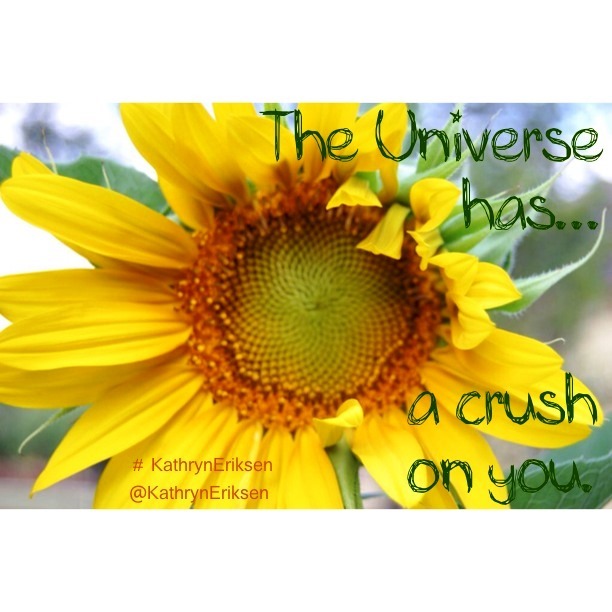 The Universe has a crush on me. I can’t prove that by empirical evidence. Eye witness accounts do not exist…only the proof of my joy and happiness as I go about my day. Smiling and laughing are the only affects I need to know that this way of life works. It’s like I am in a dance with life. You have your very own, personal wellspring with your name on it. You would not be here if that were not true. You can begin to communicate with it the instant you decide that is what you want. Once you say “YES!” to it and taste the sweetness, your eyes will open to new possibilities. And when you doubt, just remind yourself that someone has a crush on you. As a way to repay all of the kind people who have taken the time to read and/or follow this blog, if you will send me your email (or sign up on my website at www.KathrynEriksen.com, I will send you 2 Miracle Tokens. “What is in the world is a Miracle Token?” you ask suspiciously. It is a simple way to give someone a boost, or share a thoughtful insight, or even wake them up to their spirituality (I always shoot for the biggest goal). I will send you these Tokens by email, so you can print them, share them or even post them on FaceBook or Twitter. I have started leaving a Miracle Token with my tip at a restaurant. Since they contain a way for the recipient to share their experience, I can’t wait to read about what a ripple they caused. Won’t you help me spread the news? Just leave a comment, or find me on FaceBook (KathrynEEriksen) and send me a message. Or go to my website at www.KathrynEriksen.com and sign up for my emails. It’s simple, easy and fun! Whose day will you spark today? P.S. 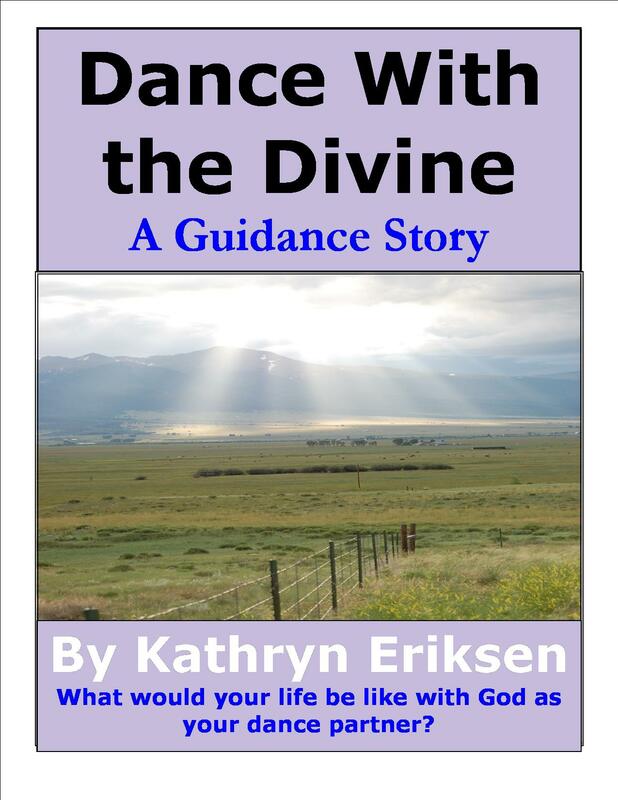 Miracle Tokens play a huge role in my latest novel, “Dance with the Divine,” which is still available as a free Kindle download. Just go to http://tinyurl.com/b3jytp5 and start reading on any mobile device or computer! Imagine that you were invited to a grand ball, the party of the year. The invitation was designed and made especially for you, with your name and address written in flowing calligraphy on the envelope. There was no return address, just a beautiful envelope that felt heavy because of the card inside. When you opened the envelope and slowly pulled out the heavily engraved card, you began to feel different. Breathless excitement and joy sprang up from a long forgotten place in you and you knew beyond a shadow of a doubt that this was something special. You are invited to be my dance partner at the Grand Ball. Please come to 1234 Main Street and I will be waiting. As the words settled in your mind, you felt a shot of energy that seemed to go straight through you. Because this was such an unusual sensation, your protective instincts kicked in and you dropped the invitation on the counter, wary and slightly concerned. For days, you ignored the invitation. You hid it from view, did not mention it to anyone and tried to forget it. The business of life kept your mind preoccupied, but that other part of you that jumped for joy when you read the message would not give you peace. It became a small, nagging voice in your head that challenged you to step beyond your fear and take a chance. One evening, you were so tired of that persistent voice that you decided to walk by the house where the party was located. It was more of a reconnaissance mission, something to do that would hopefully give you some peace from the nagging doubt that you had missed something important. As you walked slowly toward the beautiful mansion located at 1234 Main Street, you knew that you could never attend such a grand event. Long ago, because of some painful event that you no longer remembered, you decided that you were not worthy. The invitation with your name and address on it were just a mistake…a fluke…a cosmic joke of epic proportions. But what harm was there in just looking? Just as you turned the corner, faint sounds of a party – music and laughter mixed with the sounds of movement – could be heard. As you get closer, you see the stately mansion glowing with lights and energy. You feel like a moth drawn to the flame…you can’t help yourself – you had to peek in the window. Inside, the party was in full swing – singles and couples dancing, laughing and joyfully celebrating. It did not matter if everyone had a partner or how they were dressed. The love and joy on each face was enough to light up the entire room. As you stand at the window, on the outside looking in, an overwhelming sense of loss washes over you. You could have been on the inside, having the time of your life! But you let fear, doubt and hesitation get in the way and you never accepted the invitation. Because of the choice you made, you missed out on all the fun. As you turn slowly away from the window, sadness penetrating your very soul, it suddenly dawns on you that maybe you did not blow it after all. You close your eyes and picture again the embossed invitation and its message. You concentrate on the words, and then you realize that you were right. You have another chance to join the party! Your heart beats with excitement and you run back towards your home, rushing inside and pulling the invitation out of the drawer. You read it again, take a deep breath and say firmly, “I accept!” Your heart seems to burst open and your soul dances with the joy of the moment. You are now part of the dance! The date and time of the party! God gave you free will. He is also very patient with his children. He understands that you sometimes have to make the wrong choice to realize what the right choice is. God loves you so much that He keeps his invitation to dance with him open and ready to accept at all times, day or night. He wants you at the party. He has specifically invited you to be a part of the celebration of life. He waits for you to accept his invitation, and he will never give up on you. God created you in his likeness and he made sure that you would have dominion and power over your world by the gift of free will. You exercise free will whenever you make a choice – whether it is what you will wear today or what goals you will focus on in the next hour. Your choice makes it happen. Your beliefs guide your choices. Your thoughts are the basis of your beliefs. So what is your choice? Are you ready to dance with the Divine and create your life? Please join Kathryn by visiting her website at http://www.KathrynEriksen.com.